Attendees at the GEO conference come from all over the Middle East and beyond. The conference, which is held every two years in Manama, Bahrain, has been growing steadily since its inception in 1994. 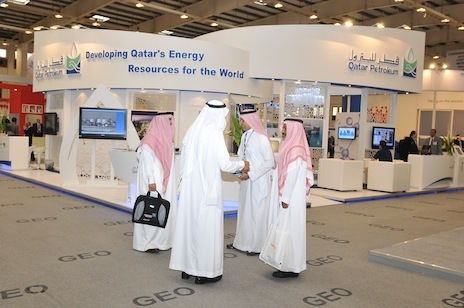 It had a total attendance of just over 3,500 in 2002, rising to 4,628 at the last conference in 2010 – and organisers expect over 5,000 attendees at GEO 2012, which will be held from 4 – 7 March at the Bahrain International Exhibition and Convention Centre. Following the opening ceremony on Sunday March 4, there will be a Plenary Session entitled ‘Shaping the Future of Geoscience in the Middle East’, with invited speakers including Abdulla Al Naim, Vice President Exploration, Saudi Aramco, and Andrew Gould, Chairman, Schlumberger. This will set the tone for the more than 360 technical papers and posters which will be presented at the conference, with topics ranging from reservoir characterisation, technologies to solve complex reservoir challenges, advances in geophysics, integration and next generation technologies, and harvesting unconventional resources, to new play concepts in exploration, human resources, and environmental and safety issues in the industry. There will also be a number of half-day panel sessions, in which participants will givetheir opinions on some of the over-arching matters of concern to geoscientists, including emerging trends in research and development, geoscience and the environment and ‘producing the last drop’. These sessions will be led by key players in the industry, and the delegates will be invited to join in the concluding discussions. GEO 2012 also offers learning opportunities, with seven short courses available, covering a number of technical aspects of geoscience. There are also three fields trips, which will be held after the close of the conference. Two of these are in Oman and one in Abu Dhabi, giving delegates the chance to develop their knowledge of the geology of this important region. The conference is organised with the support of the American Association of Petroleum Geologists (AAPG), the European Association of Geoscientists and Engineers (EAGE), the Society of Exploration Geophysicists (SEG), the Dhahran Geoscience Society (DGS), the Bahrain Geoscience Society (BGS), the Geological Society of Oman (GSO), Qatar Geological Society (QGS) and the Emirates Society of Geoscientists (ESG), together with a committee of senior regional and international industry figures. Bahrain, an independent island state in the Arabian Gulf about 25 km east of Saudi Arabia, was the location of the first discovery of oil in the Gulf, in 1932. This field, Awali, is the only one in the country and is still producing, although it peaked at about 77,000 bopd in the early 1970s and is now reported to be producing approximately 42,000 bopd. Revenues from oil and natural gas currently account for approximately 25% of GDP, but the country is also an important regional financial centre. Kathryn Shepherd, Clear Solutions International Ltd.
Is it possible to drill with environmentally friendly fluids?